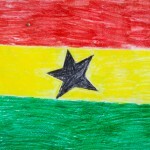 To raise awareness about the lack of education opportunities for children in Ghana, and raise funds to help us to continue taking steps to ensure the next generation has a brighter future, why not hold a Red, Gold and Green day, using the vibrant colours of the Ghana Flag! Ask everyone who attends to donate an amount for the day, or run a best dressed competition with an entry fee, you could even make some Ghana Flag cupcakes to sell on your day. This fundraising event is perfect to do with your work colleagues or school class to have a bit of fun with this twist on a mufti-day or dress-down Friday.